Both material and figurative walls are shaping our present. Now is the time for the arts and humanities to intervene with critical reflection and compassion into spaces of ‘crisis’. Pebble poetry. Photo: Agnes WoolleyThe turmoil surrounding the presidential election in America has shaken the world: fear, terror, uncertainty and despair are some of the feelings generated by this new political turn, or what Cornel West has called a ‘catastrophe’. Significantly, we are reminded that ‘27 years after the Berlin Wall fell, Europe wakes up to a U.S. president-elect promising one of his own’. Yet, another wall has already been erected in Calais, allegedly to ‘stop refugees trying to board lorries to UK’, while the Calais jungle in France has been shut down and evacuated, leaving many destitute and numerous unaccompanied children in limbo. As we witness the triumph of populism, racism and bigotry translated into a proliferation of frontiers and divisions, Gloria Anzaldúa’s words from nearly three decades ago painfully resonate with our present times, which seem deaf to the harrowing cry of history: ‘the US-Mexican border es una herida abierta (an open wound) where the Third World grates against the first and bleeds. […] Tension grips the inhabitants of the borderlands like a virus. Ambivalence and unrest reside there and death is no stranger’. The wall promised by Trump announces a curb on migration which will exponentially exacerbate already adverse and violent international migration politics and practices and, ultimately, disseminate fear. Nobel laurate Toni Morrison’s reflections in the New Yorker on this new political turn talk precisely of fear: ‘So scary are the consequences of a collapse of white privilege that many Americans have flocked to a political platform that supports and translates violence against the defenceless as strength. These people are not so much angry as terrified, with the kind of terror that makes knees tremble’. Yet Morrison elsewhere reminds us that while the ‘world is bruised and bleeding, and though it is important not to ignore its pain, it is also critical to refuse to succumb to its malevolence. Like failure, chaos contains information that can lead to knowledge — even wisdom. Like art’. In times of war and conflicts, the arts and humanities have played a vital role in enabling the healing process amongst communities, cultures and societies. As Gayatri Spivak says, the humanities ‘are the healthcare system of cultures’ and our work acquires an even more meaningful role in these times. Are we living through a period of crisis? It’s a term that has been used ubiquitously to describe current levels of migration and displacement. But what is the nature of the crisis we, in the West, are facing? Perhaps what’s going on is not so much a ‘refugee crisis’, but a crisis of values: a critical moment in our understanding of what we value as a society. This crisis of values has immobilised nation-states and intergovernmental bodies whose responses to current levels of migration in and around Europe’s borders has been increased militarisation and border controls, shady refugee exchange deals, and a reluctance to welcome refugees. Zygmunt Bauman has called this a ‘crisis of humanity’ in his recent commentary Strangers at Our Door. So, how can the arts and humanities help us in a crisis? Political theorist Wendy Brown makes the case for the importance of criticism and critical thinking at times of crisis. She notes the tendency to divide theory from practice by dismissing theorising as unnecessary at times of crisis. People say: “now’s not the time for theorising; we need action”. But, she says, the original Greek term – Krisis – describes a moment when urgent deliberation is required, when critique itself is urgent, or, from the same root ‘critical’. This sense still persists in medicine, when we say someone is in a ‘critical condition’. We also talk about a time being a ‘critical moment’. This sense of critical decision-making also extends to refugees themselves and the critical, often life-threatening, decisions they are making daily. Now, is perhaps a critical moment – one where urgent deliberation about Europe’s approach to refugees is required. The inaugural event of the network engaged with the issue of ‘crisis’ and raised a number of other important questions: How can we enable productive collaborations on the issue of forced migration? ; Who are the intended audiences of the artistic practices by or about refugees? ; How can we create a third space for dialogue about refugees that is not political or personal, but social? Our aim was to share knowledge, skills and experience in the area of forced migration and we heard from academics, arts practitioners, and those who work in the voluntary sector. We gained valuable context in the form of the historical legacy of colonialism from Roger Bromley, who argued that a sense of history is a vital component of our response to crisis, and Neelam Srivastava raised important questions about contemporary and historical practices of commemoration for refugees, showing a clip from Dagmawi Yimer’s 2013 film Asmat/Names. Taking us into the mechanics of seeking asylum, Anthony Good and Carolina Albuerne spoke from their research and practice with asylum claimants, exposing the inadequacies of current systems for applying for asylum and raising crucial questions like: how can we get better at facilitating refugees to speak for themselves? What constitutes self-representation? And how can we be better advocates with a sense of our own positioning? Kristin Shirling, who has been working with Good Chance theatre in the Calais ‘Jungle’, voiced her strong support for the role of the arts in situations of crisis, arguing that when one is dehumanised, a place to ‘be a human being’ is vitally important. Detention Action’s Jerome Phelps’s discussion of the spatialisation of power worked across scholarly and practice-based approaches to forced migration by grounding his comments in the campaign against the UK Government’s detention estate. An evening of poetry and film at Keele Hall (which, incidentally, had a brief incarnation as a refugee camp during WWII) forged connections between the arts and the ideas and questions that had arisen during the day. We heard from poets James Sheard, Saradha Soobrayen and Robert Hampson and the audience were encouraged to participate through ‘Pebble Poetry’. 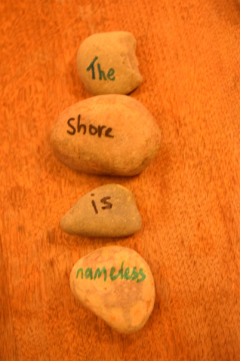 Pebbles inscribed with words, phrases and thoughts from participants enabled mutual sharing and reflection on the meaning of welcome, arrival and displacement. Poetry was a means to collectively address the challenges of our present and to think about how our world is offering, or failing to offer, ‘refuge’. The pebbles will travel from Keele to Naples in Italy and to London – our next scheduled events – ultimately building a shore to safety and offering a welcome written in stone. Our project is fuelled by a renewed energy in these increasingly challenging times. As Toni Morrison insists: ‘this is precisely the time when artists go to work. There is no time for despair, no place for self-pity, no need for silence, no room for fear. We speak, we write, we do language. That is how civilizations heal’. Read extract from ‘Sounds Like Root Shock’: a poetic inquiry into the depopulation of the Chagos Archipelago by Saradha Soobrayen.